Cal was outgained by over 200 yards: 582 to 370 (more on the defense below). However, much like the FSU game, Cal was able to convert on critical 3rd downs against Colorado – the Bears were 7 for 13 (54%) on 3rd down conversions vs. only 6 of 17 (35%) for the Buffs. More importantly, Cal was 6 of 6 in the red zone (5 TDs & 1 FG) vs. 3 of 4 for Colorado (all 3 FGs). Zach Maynard was only 18 of 35 for 243 (6.9 YPA), but threw 4 TDs to 1 INT. Maynard’s completion percentage would have been higher, but his receivers dropped as many as 6 catchable balls. Coach Tedford noted in a postgame interview that 6 of Maynard’s passes were dropped – if these 6 were included into Maynard’s totals, he would have had a solid 62% completion percentage. Zach connected with his brother Keenan on several big plays, including a long pass on 1st & 30 in overtime, and of course the game-winning TD. 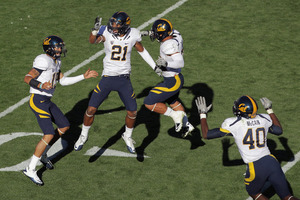 Maynard even caught a pass of his own, on a throwback from Allen in the 1st quarter, which set up Cal’s first TD. Anthony Miller (2 TDs, both highlight-reel worthy, despite 2 drops of catchable passes) and Michael Calvin (3 catches for 42 yards, including a big 3rd down catch) also had nice games. 3rd string FB Nico Dumont even got into the action, catching a pass in the flat off play-action, resulting in Cal’s 2nd TD of the game. In general, while converting big plays on critical 3rd down situations is a positive, the passing game needs to be more consistent. Zach is doing a good job in hitting the intermediate routes, but needs to improve on the shorter timing throws. He needs more help from his receivers though – mainly, no more drops. The receivers have been getting better separation on their routes, which is great for the offense, but Coach Kiesau should also focus on preventing future bouts of the “drops” from his WRs. The running game continued to struggle though – only 100 yards on 31 total carries, for a subpar 3.2 YPC average. While this number included sacks, it also accounted for Maynard’s negative rushes on QB keepers. Sofele had 20 carries for 84 yards, for a decent 4.2 YPC, but Maynard had a negative yardage total for the game. Perhaps it was due to the gameplan, but JT did not call as many designed runs or zone read plays against Colorado, which was curious considering how vulnerable the Buffs were during their opener vs. Hawaii. C.J. Anderson showed flashes of his vision, balance, and overall running ability, scoring a 19-yard TD and also converting a critical 3rd down in OT. Anderson, now that he is becoming more comfortable with the playbook and blocking assignments, proved that he deserves more carries in upcoming games. 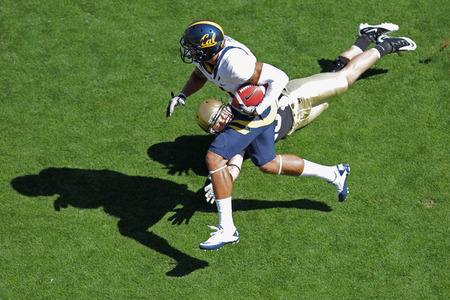 Combined with reports that highly-touted freshman RB Brendan Bigelow will be taking off his redshirt this Saturday (vs. Presbyterian), Cal’s running game has the potential to be more dynamic as the season goes on. JT noted after the game that Sofele has been banged up, so Coach Gould will need to find ways to get the other RBs more involved. The other key question, as it has been since spring ball, is whether the OL can improve and do a better job opening holes up front. Coach M continues to have his work cut out for him in that regard. Defense: Was the Pass D Exposed or Did Hansen & Richardson Just Have Unreal Days? The final stat lines for Colorado seem to say it all: 582 total yards, 474 passing & 108 rushing. 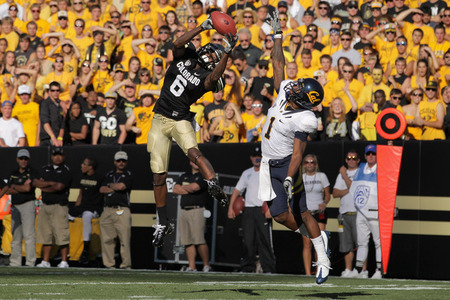 Buffs QB Tyler Hansen (28 of 49 for 474 and 3 TDs) and WR Paul Richardson (11 catches for 284 yards and 2 TDs – both on long YAC plays) both had career days, setting school records in the process. At first glance, the Bears got completely out-schemed and out-executed. However, on closer analysis, it’s not all on the coaches (i.e. Coach P’s gameplan/playcalls) nor all on the players (lack of pass rush up front, plus coverage breakdowns in the secondary). CGB’s Kodiak does a great job analyzing the defensive schemes and execution. As for the answers to the 2 questions above – yes to both. Hansen & Richardson clearly were playing out of their minds on Saturday. They were no doubt pumped up for the game, especially senior QB Hansen, who likely wanted to atone for a poor performance in last year’s 52-7 beatdown at Memorial. Sophomore WR Richardson, who was a teammate of USC’s super-soph WR Robert Woods in high school, showed why he is one of the Pac-12’s rising stars. He repeatedly cut through zones, also beat man coverage, and burned the Cal secondary for long gains. Both Hansen and Richardson were helped by the lack of an effective pass rush from the Bears. Cal had no sacks, with Hansen escaping rushers several times, and were repeatedly victimized on screens (especially in the 1st half) and quick 3-step drop throws. While Cal’s defensive gameplan was mostly vanilla (lots of 4 man rushes, with Cover 1/man coverage), Coach P did make adjustments in the 2nd half. He mixed up both the coverages and blitz schemes, including sometimes rolling a safety over the top and also putting DB Steve Williams on Richardson. In fact, Williams made 2 key pass breakups – one near the end of regulation, and one in OT – to prevent Colorado from scoring TDs. Fellow corner Marc Anthony had a rough day, as he was mostly matched up against Richardson when they playcall was for man coverage. Coach P reportedly was very disappointed in his secondary after the game, but remains confident that their performance in Boulder was a one-game aberration. It wasn’t just the secondary’s fault though, as the pass rush was often a step late in getting to Hansen – Colorado’s much-maligned OL (coached by Steve Marshall and down at least 1 starter) won most of their 1-on-1 battles and held their blocks long enough for Hansen to make a play. Interestingly, Cal did not rotate their DL as often as predicted, which perhaps caused the big guys up front to wear down more quickly, especially considering the altitude. As a group, the OLBs were nearly invisible during the game – freshmen Chris McCain & Cecil Whiteside got relatively less playing time, compared to the more experienced Ryan Davis & Dan Camporeale. While Campo & Davis are better in knowing their assignments, they are arguably less dynamic as pass rushers. Coach P knows that his DL and OLBs must provide a better pass rush in future games, versus Pac-12 competition, particularly against experienced QBs such as Andrew Luck, Matt Barkley, and Nick Foles. Tavecchio had another PAT blocked – on the 1st TD of the game. This one wasn’t really his fault, as it looked like the right side of the line collapsed, particularly the right guard. Nevertheless, 3 blocked PATs in 2 games is inexcusable, and a continuing cause for concern in upcoming games. Coach Genyk needs to make sure that the blockers up front are keeping leverage and maintaining their assignments. Fortunately, the missed PAT did not cost the Bears too much, as they were able to win the game in OT (despite the miss ultimately giving Colorado the opportunity to tie up the score in regulation). Also, Bryan Anger nearly had a punt blocked, as Colorado’s rushers got through. Anger went down awkwardly on that play, but luckily was not hurt, while the Buffs were flagged for roughing the kicker. If protection problems continue in the punting game, perhaps Coach Genyk should consider returning to the traditional punt formation, instead of the “shield of death” (a 3 man wall in front of the punter, while the rest of the punt team runs downfield) that is currently being used. One last note, Marvin Jones was flagged for a ticky-tack illegal substitution penalty following a punt return, for taking off his #47 “vest” on the field instead of on the sideline. He normally wears #1, but puts on the vest over his jersey, because #1 Steve Williams is also on the PR team. The staff will take note of this, and should make sure that Marv’s Clark Kent/Superman routine after punt returns happens on the sideline, before he returns to the field on offense.